Ready to get on a roll toward more productivity and uptime in a highly maneuverable wheeled excavator? The John Deere 190D W Wheeled Excavator will go where many tracked machines fear to tread. 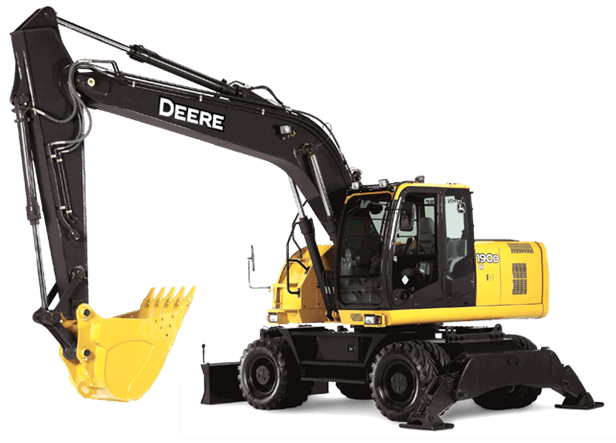 This excavator delivers the smoothness, ease of operation, and comfort you've come to expect from John Deere. From the ultra-dependable, fuel-sipping diesel to its rugged D-channel side frames, this wheeled excavator is built tough for unsurpassed reliability. Its highly efficient cooling system keeps things running cool in any environment. And like its tracked siblings, it features a bevy of traditional John Deere durability features, including tungsten-carbide thermal-coated arm surfaces, oil-impregnated bushings, and welded boom bulkhead. Add any of the many available options to tackle a wide variety of on- and off-road work. Discover the freedom of motion that allows your operator to simply drive - no trailer involved - between worksites. Hey, that's the way we roll.